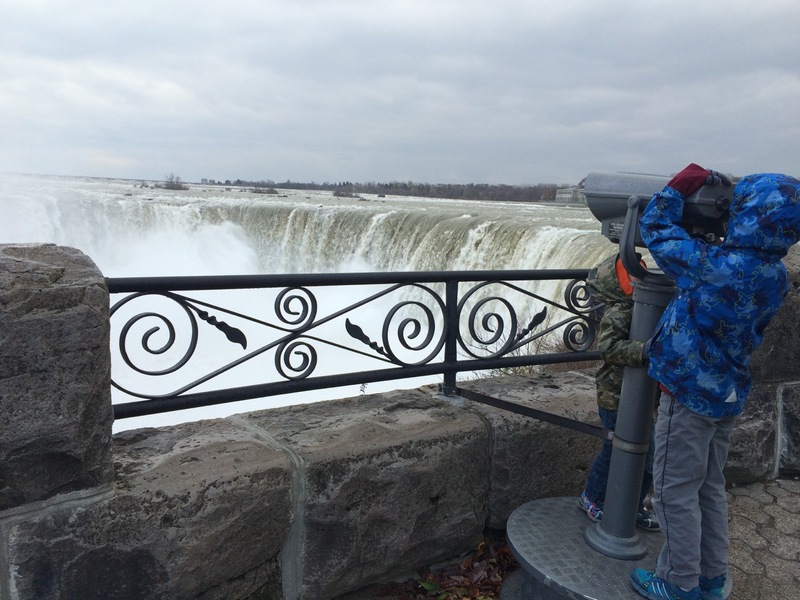 One Day in Niagara Falls | Kids in T.O. There is something about the off-season — Canada’s Wonderland in May, Centre Island in September or Legoland Discovery Centre outside of March Break. If you’re able to swing a visit when tourists are out of town, you can experience the Toronto’s finest crowd-free. That’s what we did on a recent PA Day. We skipped TOwn to introduce the kids to the tourist mecca Niagara Falls. Traffic was light (leaving at 8 a.m.) and 1.5 hours later we basically had the Falls to ourselves. Yes, it was misty and cold but the chance to run alongside this force of nature without the crowds was well worth the wet feet. How to experience the Falls: Photo opp with the kids in front of the Falls, done. Before heading out consider getting one-step closer. Journey Behind the Falls takes you 45 metres (150 ft) down via elevator to explore the tunnels at the foot of the Falls. Niagara’s Fury tells the story about the formation and power of the Falls through a recreated experience (moving platform, water spraying, gorgeous views.) Both are family-friendly and take about 45 minutes. Kids 5-and-under are free. PS – the Falls are illuminated every evening beginning at dusk and there are free firework shows every Friday, Sunday and holiday at 10 p.m. (weather permitting.) For the best view, head to Queen Victoria Park. You can also take in the view from 53 metres (175 feet) above on the SkyWheel at Clifton Hill. The gondolas are year-round and offer an incredible (8-12 minute) vantage point of the Horseshoe and American Falls and the Niagara River. 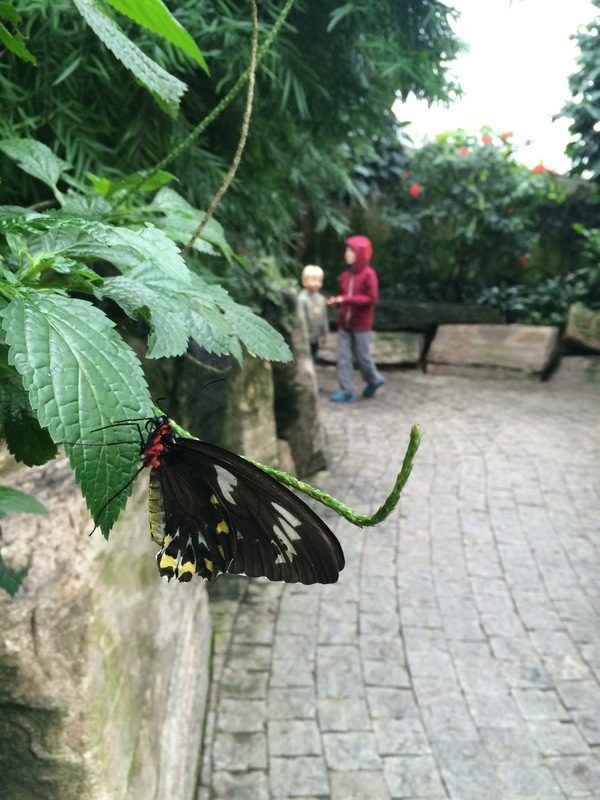 Here you can also go full-on tourist with a bunch of family attractions. Stop for a hike: In between the Falls and the Butterfly Conservatory, we jumped off the beaten track and explored the Niagara Glen and its 4 km (2.5 miles) of trails. The Glen overlooks the Niagara River Whirlpool, where the water has eroded its way through the Niagara Escarpment, creating the Great Gorge, a right-angle turn in the river’s path that forces the water into a deep counter-clockwise spin. The area is free and a guaranteed energy burner for the kids in TOw. Getting there: Driving from Toronto, we started our visit at the Table Rock Visitor Centre at Horseshoe Falls. There are parking lots at all the tourist areas. You can purchase a daily pass ($25) at any lot or pay station and have one day of unlimited in and out privileges for one day. Getting around: If you’d prefer to leave the car parked, take the WEGO, a year-round bus system that connects the various Niagara Falls tourist areas (with stops at hotels too.) A 24-hour pass is $7.50 for adults; $4.50 for kids (6-12) and kids 5-and-under ride free. Stay over: It is so easy to make a weekend of it. You can add a little splash to your visit at these family waterparks Great Wolf Lodge, Fallsview and Waves Indoor Waterpark.